Will it soon be easy to get off (and then back on) I-71 at Western Row? That's usually the preferred exit option when navigating interstate highways, but many exits aren't configured that way. The cost to update them often runs into the millions of dollars. That's the case at I-71 at Western Row. "This interchange is part of an area that ODOT planned a long time ago, probably 50 years ago," said Neil Tunison, Warren County Engineer. He said the Western Row exit off of I-71 was built in the early 1970s because a brand new attraction was opening in Warren County . "When Kings Island came in 1972, they built the northbound off ramp and the southbound on ramp." The idea was for the Western Row exit to allow Kings Island visitors, who were mostly traveling from Cincinnati, to easily take I-71 north to the amusement park and then I-71 south to go home. Planners at the time didn't see an immediate need for access ramps to handle traffic from the north. "It was going to be a full interchange, but that particular project didn't get traction," Tunison said. However, that area of Warren County, Mason and Deerfield Township grew over the years and attracted a number of businesses, including Cintas, Luxottica, the Lindner Family Tennis Center, AtriCure and Procter & Gamble. "The issue has been growth," said Mason City Manager Eric Hansen. "The businesses there are all succeeding, have all grown rapidly. Festo is an example. They're tripling their footprint, adding another 350 jobs." That growth created a need for the businesses and residents to have better access to I-71 north off Western Row. According to Tunison, other businesses were interested in moving to the area, but they needed an interchange that would work with their business models, so Mason, Warren County, Deerfield Township and Springboro formed a Transportation Improvement District — a TID. "Where it really showed its worth was in how the funding was organized because you're able to speak with one voice there," Hansen said. The cost to expand the interchange was around $25 million. To get much of the money, government agencies had to convince the Ohio Department of Transportation's Transportation Review Advisory Council of the need. Warren County business leaders attended the meeting as well to convince the TRAC members their area warranted the funding. "We were able to tell a good story, (an) economic development story," Tunison said. "How we're improving safety, mobility in the area." 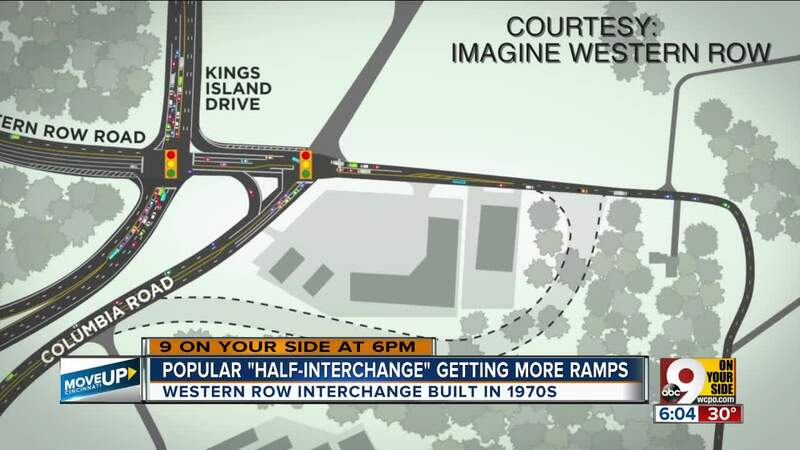 It was a 10-year process, but by Friday the interchange was nearly complete. "(It took) a lot of thought, a lot of energy," Hansen said. "The last couple years have been more gratifying because once the funding was identified, once the mechanics were put together, it's a matter of the contracts and the folks getting the actual construction done." Construction on expansion of the Western Row interchange began in 2017. One of the key objectives was to address the safety issues with Columbia Road. "It was congestion," Tunison said. "Just a high accident area." Engineers came up with the idea to relocate Columbia Road to the east and create more separation from Western Row. The new northern ramps from Western Row to I-71 opened a few weeks ago. Once complete, the project will increase the total access points to I-71 from two to six. That includes access from Innovation Way, which can be used ease congestion along Mason-Montgomery Road. "It was always anticipated some day to be a full interchange," Hansen said. "That's why this month is so significant. It's finally arriving." The southbound access lanes to I-71 aren't open yet. They are expected to open in February. Meanwhile, transportation leaders say commuters in the area will already see the difference with northbound access open. Kings Island-goers will see the difference when the park opens this spring. Throughout 2019, 9 On Your Side will bring you stories about transportation and regional growth as part of a series called "Move Up Cincinnati." We will tell the stories of the people who are driving local change, as well as the people who are left behind. You can comment or send us your story ideas to moveupcincinnati@wcpo.com.